When Tech N9ne returned to New York City recently, fans could not have anticipated the wild night that they were in for. 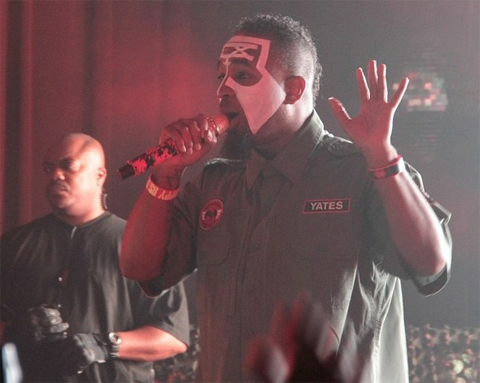 Leading the way for the Hostile Takeover 2012 Tour, Tech N9ne and Strange Music commanded the stage inside the Highline Ballroom for one of their best shows ever in The Big Apple. It’s hard to fully convey the overwhelming euphoria of an all-out Tech N9ne performance. Dancing girls, moshing jocks, and crowdsurfing Juggalos are all components of the freewheeling, hard-rocking, no-holds barred energy that thumps in your chest and assaults your ears. The machine-like precision rapping is a wonder to behold, and Tech’s delivery is always impeccable. From the excitement on stage to that of the crowd, Tech N9ne’s performance at the Highline Ballroom was another high note on the record-breaking Hostile Takeover 2012 Tour.